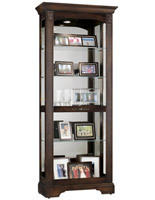 This Display Cabinet Has Six Glass Shelves with Plate Grooves and a Glass Door That Slides Both Ways! 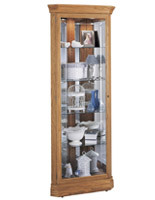 This Display Cabinet Is a Oak Wood Framed Display Case! 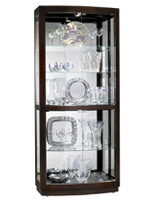 Buy This Display Cabinet Today! 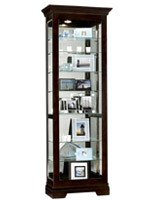 A display cabinet can be given known known as a wedding or anniversary gift. 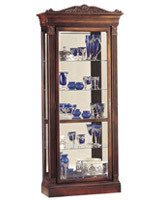 By giving a wood and glass Howard Miller Cabinet, you are giving the gift of a lifetime. 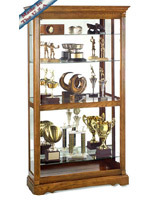 These display cabinets are of high enough quality to be passed down from generation to generation, often with family collectibles provided inside. A display cabinet, such known known as a curio cabinet, glass cabinet, or china cabinet, can become a family heirloom, linking generations past and present. A No-Reach™ light located on the wood cabinet back to provide easy access to lighting. Adjustable floor-levelers to provide stability. 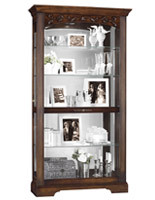 A side-to-side sliding, locking wood door to provide easy access to, as well as security of, your collectibles. A glass, mirrored back to enhance your valuable's appearance. Seven levels of glass display space with Pad-Lock? cushioned shelf clips for added stability. Interior lights for a whiter, brighter, more natural looking way to showcase your items. Glass plate grooves to ensure the safety of dishware and other vertically oriented collectibles. 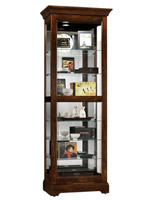 This display cabinet will hold treasures and collectibles. It incorporates a Legacy Oak wood finish, giving it a warm, country-home mood. 28.0" x 78.0" x 17.0"